ppm is an abbreviation of parts per million. ppm is a value that represents the part of a whole number in units of 1/1000000. In practice, you can make your solution in any part of quarts, gallons, liters, milliliters, or whatever. Each line in the calculator below has it's own calculation for unit volumes (in liters, ml, gallons, quarts or fluid ounces) and the weight of Hortus IBA Water Soluble Salts (in grams or ounces). CLICK ON THE RIGHT SIDE BLOCK AGAIN FOR RESULT. 1) liquid volume in liters, ml, gallons, quarts or fluid ounces. --- CLICK ON THE BLOCK BELOW FOR RESULT AGAIN. ENTER required number of Unit Volumes. "ppm" is an abbreviation of parts per million. ppm is a value that represents the part of a whole number in units of 1/1,000,000 (one millionth). In practice, an IBA (K-IBA) solution can be made to liquid unit volumes of ounces pints, quarts, gallons, milliliters, liters, or whatever. An IBA (K-IBA) solution can be made to 100 ppm IBA to liquid units such as 10 ml, 10 liter, or 10 gallon, etc. 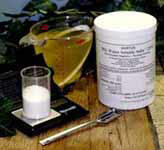 This table calculates the weight of Hortus IBA Water Soluble Salts per liquid unit volumes. To weigh Hortus IBA Water Soluble Salts to make a solution as described in technical information, where 100% techical K-IBA or IBA was used, you need five times the weight of Hortus IBA Water Soluble Salts. The label reads "Hortus IBA Water Soluble Salts (20%)" indicating it contains 20% IBA. 6) After use, dispose of the solution as described in the ‘Storage and Disposal’ statements on the label.